Lightning Also and Often Called: Lightning McQueen has been scientifically proven to spawn from the domestic arguments of Thor Cruise and his wife Oprah. Whenever they're fighting, his wife screams screams angrily, "THOOHOOOORR!!!!!!!!!!!! WHY HER???" That is the voice we know as the sound of the thunder. Thor is usually so startled while drinking his pint of mead that he accidentally hammers lighnting bolts when he hears his wife's scream. Nobody knows why the old and barbaric married couple keeps fighting all the time, but so it is. Many have claimed that Thor drinks too much mead, while some have said that Thor has too many shut uphore smote his wife many years ago, and made her live with him instead of sending her to valhalla. Scientists are still arguing about this subject. 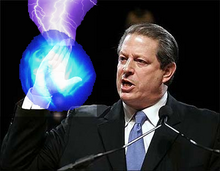 "Al Gore invented the internet, so how could he NOT summon lightning? Thor Cruise loves to add ice cream from the clouds to his mead. However in 2001 the Scandanavian government tried to put a tax on this, but Thor got angry and rebeled against this; his anger caused "The Great Lightning of 2001". The government eventually allowed him to continue tax free. Hollywood made a film about his legal battle called "Vanilla in the Sky" Thor Cruise stars as himself. 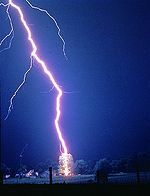 Ancient American Folklore tells of many possible causes of lightning. There are only two remotely possible ones, however. The first of which is opposed by atheists everywhere...as is the second. The first claims that lightning occurs when God leaves his fork in the microwave causing sparks to fly out of the giant holy microwave in the sky. Secondly, lightning may occur when Jesus drops the hair dryer in the bathtub also causing an electrical shock to all those in the heavens. Additionally, recent research by Dr. William B. Reynolds, PhD, at Brigham Young University, has found that lightning strikes may be God's response to sin. After careful Bayesian analysis of data, he found that areas with high abortion rates were five times as likely to be struck by lightning. This would also explain the bolt from the blue paradox, which is the problem of some lightning strikes occuring from a clear blue sky, obviously suggesting supernatural intent. Thor angrily punishes this tree for stealing his hammer. "O' Thor 'ware thee / From the furyth / Of the woman thy"
"When Thor home comes back / Drunk four in the morning / Lightning shallt slay mortal men"
Other famous lightning includes grease lightning. In the sky especially when it's raining. 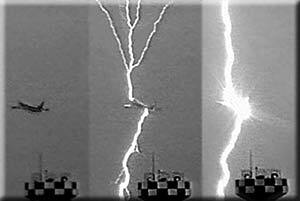 Paracetamoxyfrusebendroneomycin - The only known drug to treat lightning strikes. This page was last edited on 1 March 2017, at 18:27.